In My Obstacle Course stations, I like to include math activities that get my son involved in what the concept really is, not just pencil/paper math memorization. 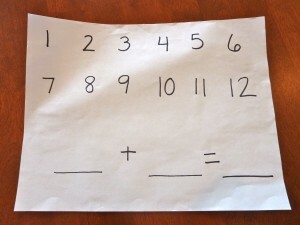 Try this if your child is just learning their basic math facts or is having some difficulties because they just don’t get what they are supposed to be doing. This idea can help them get a better understanding of what the process is when presented with addition and subtraction equations and also help them practice their facts in a fun way. I love to use dice because it adds randomness, and I have found that bits of randomness helps keep things interesting. While there is a time and place for practicing math facts with pencil and paper (in fact, that can be added to this activity if you’d like- either written out by you or your child on a dry erase board, chalkboard or sheet of paper), I think that practicing with actual items is important when forming a good understanding for something that progresses into more abstract concepts. 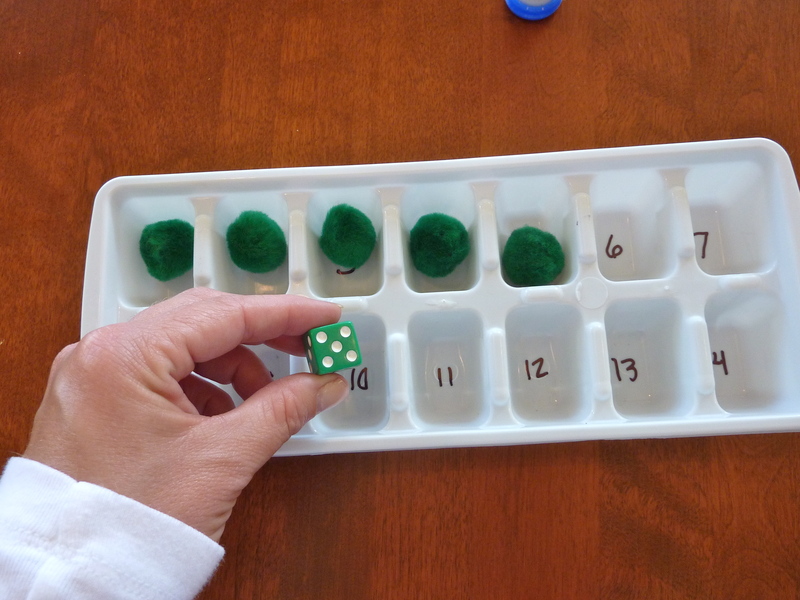 These easy to make math organizers are perfect for practicing math facts with dice and manipulatives (fancy word for items used for counting). 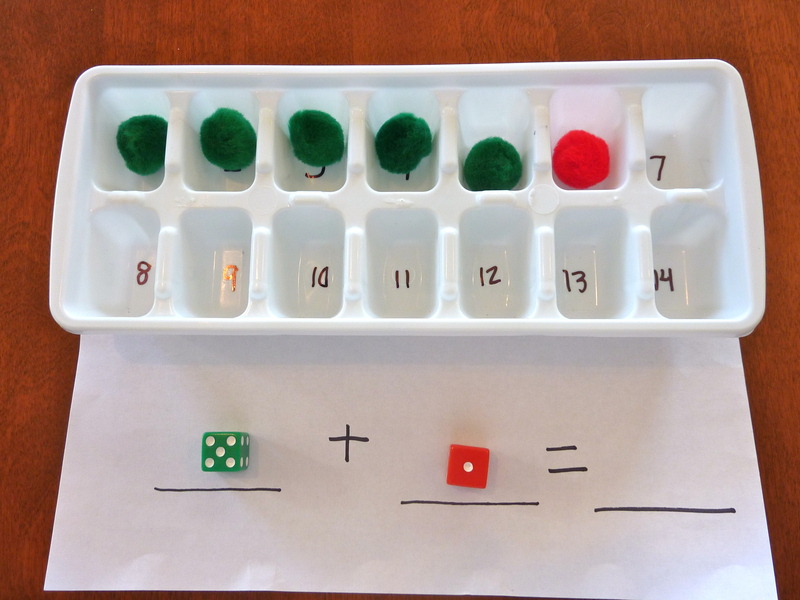 These organizers allow the child to have a space for the manipulatives to go, along with the number, so they get a good visual of what they are really doing. 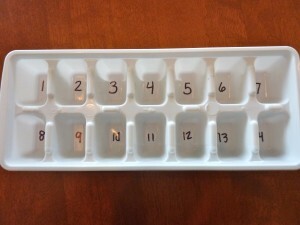 An ice cube tray with numbers 1-14 written with permanent marker on the bottom. 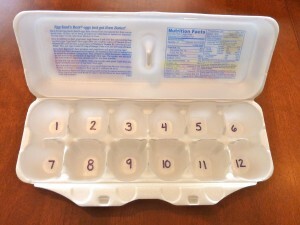 Clean and dry an egg carton. 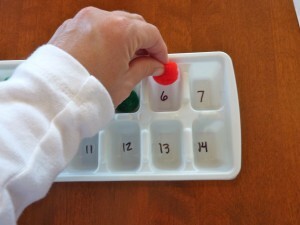 Write numbers 1-12 with permanent marker on the bottom. 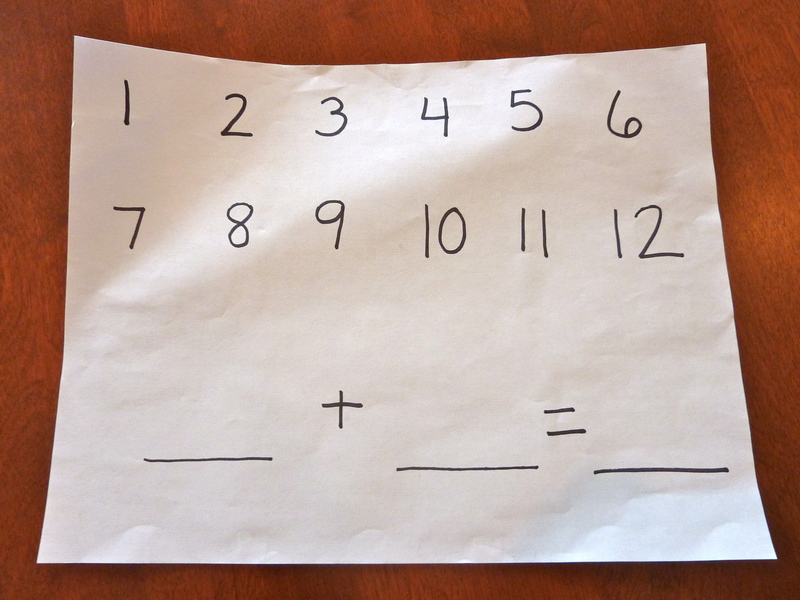 Take a blank sheet of paper and write numbers 1-12 on it. Write an addition equation with blank lines where the numbers being added (addends) and the answer (sum) would be. 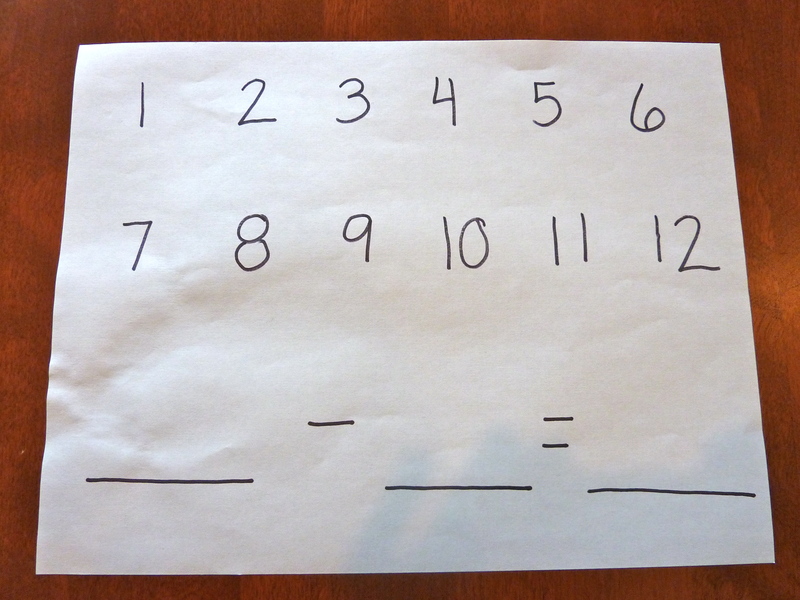 Take a blank sheet of paper and write numbers 1-12 on it. Write a subtraction equation with lines where the starting number (minuend), the number being subtracted (subtrahend) and the answer (the difference) would be. 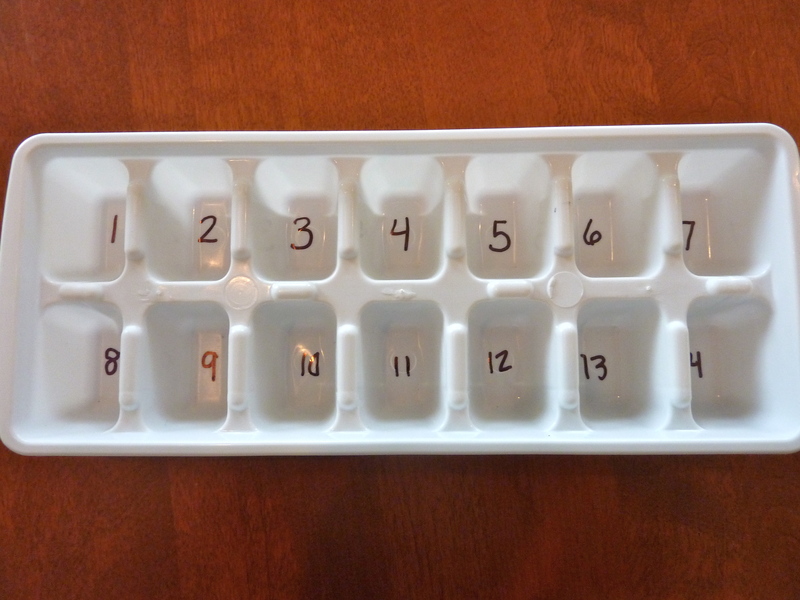 Step 1: Take an ice cube tray math organizer. Add 2 dice (I used red and green dice to go with the holiday theme) and 12 manipulative items or counters (I used 6 red and 6 green colored puffs to provide additional visual cues). Step 2: Roll the dice. Step 3: Count out correct number of manipulatives to go with the number rolled on each die. Step 4: Place the manipulatives from one die into the ice cube tray, starting with 1 and moving across. 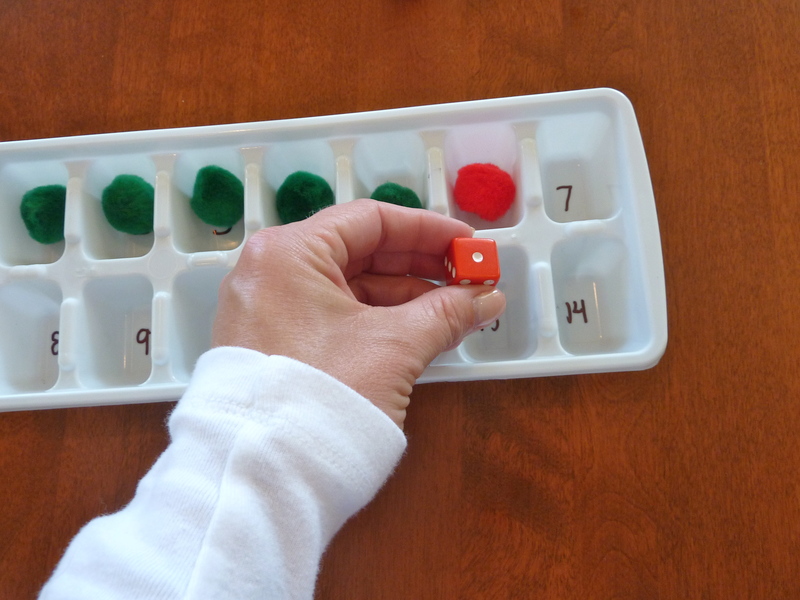 Step 5: Place the manipulatives from the other die into the tray. 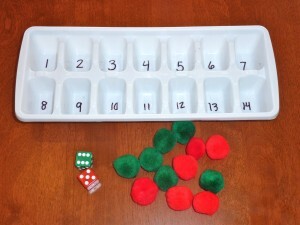 Step 6: The section of the tray that has the last manipulative in it is the sum. It may help your child understand the relationship between the equation and what they are doing with the organizer by providing a place for the dice. Empower: This aspect is so helpful to see if your child is understanding and if not what aspect of the process is causing issues. Great information to pass on to their teachers and/or therapists so they can help build skills from where your child is! 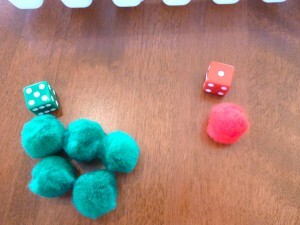 A note for those of you biting your nails because you don’t have colored dice or puffs just sitting around your house. You can use other items you have in your house that can be counted and in future posts I will show ideas of things to use that you may not have even thought about for math. Having been a teacher, I enjoy keeping with themes and will share with you items I find to help keep the activities interesting, colorful and kid-friendly.